Curb appeal begins at the curb...make that great first impression !!! The Original Mailbox Store...Three Generations In The Business. 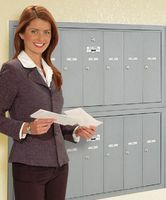 We offer a wide variety of styles and colors to choose from including commercial and residential mailboxes, locking mailboxes, post and wall mounted mailboxes and address plaques. Most of our products are constructed from aluminum, brass, and copper along with stainless steel hardware and powder coat finishes to provide you with many years of reliable service... Thanks for looking. Today's Internet Special.....Free Shipping...Everything in our store ships free. No last minute surprise or inflated shipping and handling charges. What you see is what you pay.